Bright tasting, these muffins are perfect for an early spring morning. We like the sweet-and-tart taste that makes these muffins one of our all-time favorites. Make them in the regular size for breakfast, or mini-sized for teatime. 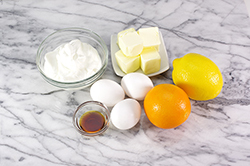 We’ve included a double dose of citrus in these muffins – both orange and lemon. 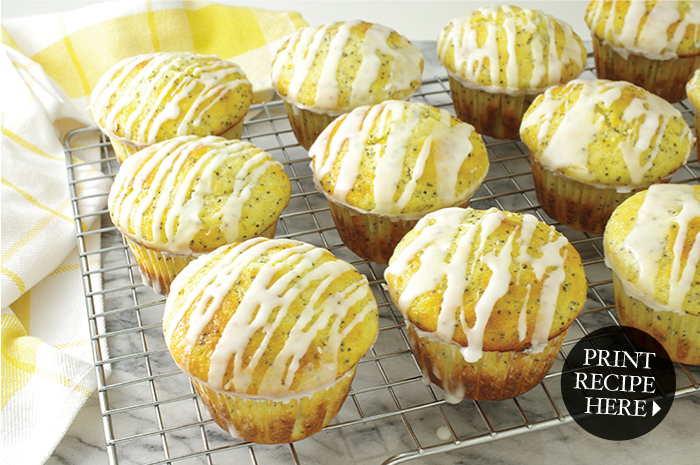 Their zest and juice define the flavors of both the muffin and icing. The poppyseeds add a nutty, crunchy touch to this variation on a classic. You’ll find that each bite of these muffins is a delight! 2. 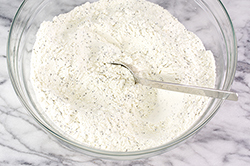 In a large bowl, mix the flour, baking powder, baking soda, salt, sugar, and poppyseeds together by whisking well to evenly distribute all the ingredients throughout the flour. 3. Melt the butter on the stovetop or for 30 seconds in the microwave. Allow to cool. 4. 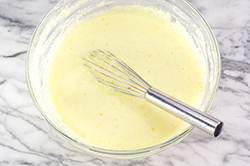 In a separate, large bowl, whisk together the eggs, yogurt, orange zest and juice, lemon zest and juice, and vanilla. Whisk in the cooled, yet still liquid butter. 5. 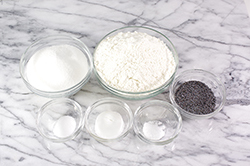 Combine wet and dry ingredients by adding the dry ingredients to the liquid ingredients. Fold gently until uniformly mixed; do not over mix. 6. Spoon the batter into the prepared cups. The batter will be thick. Fill the pans about three-quarters full. Bake in a 400°F oven for 14-16 minutes for regularly-sized muffins, or 10-12 minutes for petite mini-muffins. The muffins are done when a fingertip touch on the top of a muffin springs back, or when a toothpick inserted into the center of a muffin comes back clean. 8. Shortly before icing, mix the glaze by whisking the powdered sugar, vanilla and lemon juice together. 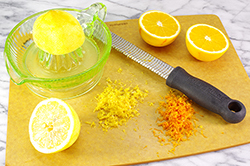 Begin with one tablespoon of the lemon juice and add by the half-teaspoonful until the glaze is the right consistency, one that forms a 2-3 second ribbon when drizzled into the bowl. 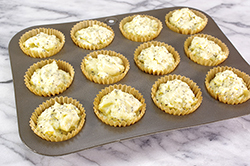 With a whisk or fork dipped in the icing, drizzle over the cooled muffins. Serve warm or cool.